In the world renewable energy sector, including large hydropower, employed 10.3 million people, directly and indirectly, in 2017. This represents an increase of 5.3% over the number reported the previous year. 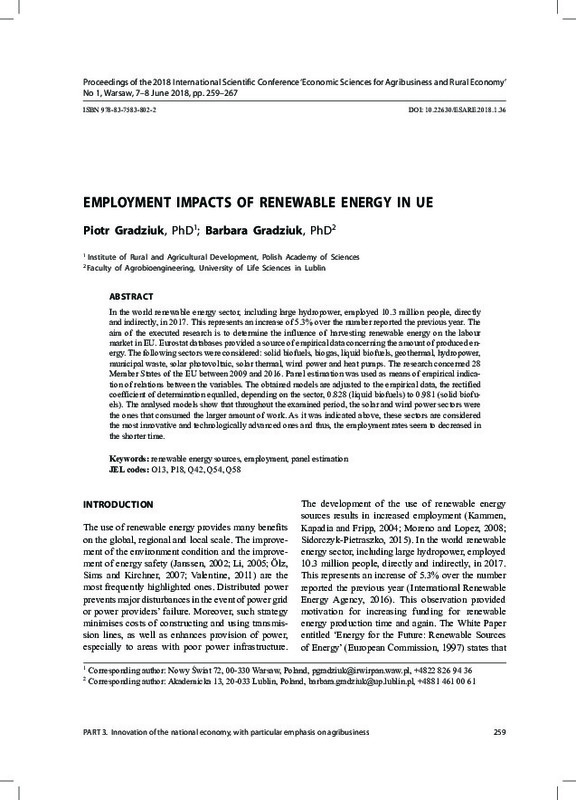 The aim of the executed research is to determine the influence of harvesting renewable energy on the labour market in EU. Eurostat databases provided a source of empirical data concerning the amount of produced energy. The following sectors were considered: solid biofuels, biogas, liquid biofuels, geothermal, hydropower, municipal waste, solar photovoltaic, solar thermal, wind power and heat pumps. The research concerned 28 Member States of the EU between 2009 and 2016. Panel estimation was used as means of empirical indication of relations between the variables. The obtained models are adjusted to the empirical data, the rectified coefficient of determination equalled, depending on the sector, 0.828 (liquid biofuels) to 0.981 (solid biofuels). The analysed models show that throughout the examined period, the solar and wind power sectors were the ones that consumed the larger amount of work. As it was indicated above, these sectors are considered the most innovative and technologically advanced ones and thus, the employment rates seem to decreased in the shorter time.